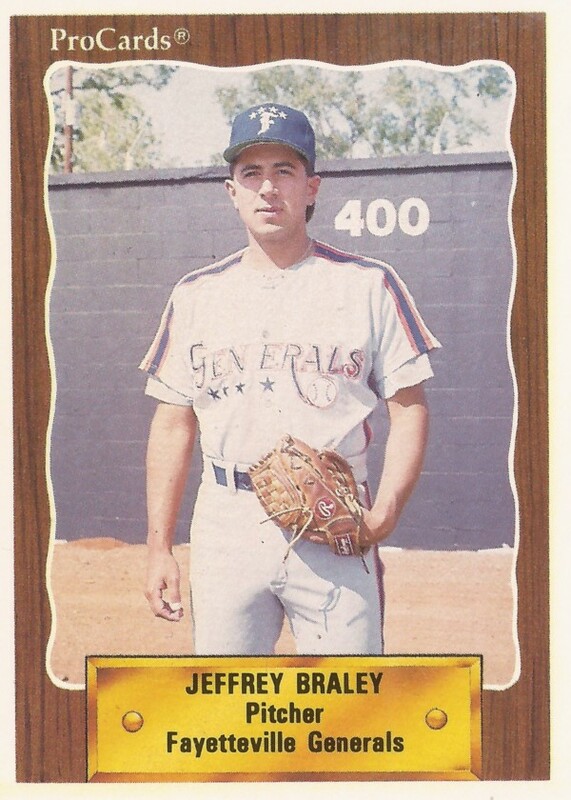 Jeff Braley recalled is coaches trying to change his pitching motion as a kid, but he stuck with it, according to The Fayetteville Observer. The motion Braley stuck with: Sidearm. "I think it's more natural to throw sidearm," Braley told The Observer. "I think everybody throws like that when they first start out (as a youngster), but then they start throwing overhand. I kept throwing sidearm and I guess I was successful." Braley succeeded enough to turn pro and play five pro seasons. He made AA, but he never succeeded enough to make the majors. Braley's career began in 1989, signed by the Tigers as a free agent out of Western Michigan University. Braley started with the Tigers at rookie Bristol. He turned in a 2.05 ERA over 23 relief outings. He also saved six games. He moved to single-A Fayetteville for 1990 and became the team's closer. He won nine games, saved 27 and finished with a 1.87 ERA. He also made the league all-star team. At high-A Lakeland in 1991, Braley continued his closing ways. He saved 24 games over 61 outings, and had a 2.62 ERA. He picked up his 12th save with a perfect four-out performance and his 16th save in a July game, striking out two in the ninth. Braley made AA London for 1992. He saved six games and had a 2.53 ERA. He gave up two hits while getting four outs in an April game. He then returned for one more season, back at London. He got into just nine games, posting a 4.72 ERA, ending his career.